Experience flavorful 3D graphics, smooth mouse controlled ball-rolling, hilarious characters - and more! Five brand-new alleys including an Iceberg and Jungle await. As you play, earn points and cash and unlock alleys and balls. Even customize a ball with your own settings and images! The most realistic Mac 3D bowling game ever made is BACK! Five brand-new alleys, 25 new eye-catching balls, tricky computer opponents, insane new modes and the most realistic physics to date. 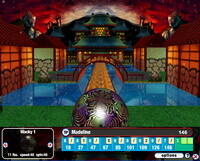 The download is WELL worth the wait for hands down, THE Best Bowling game for the Mac os!